Waterman granted over $100,000 from California Employment Training Panel | CVF Capital Partners, Inc.
Exeter — Finding the right person for the right job in an organization is only half of the battle. The other half is training them. On a tight budget companies find it strenuous to not only keep up with day-to-day tasks but training someone on their job throws a wrench in the whole thing. Even worse, when an employee is not trained appropriately they make mistakes along the way that are not necessarily their fault. And while that may be the case for a lot businesses in the area, one business is being granted a break. 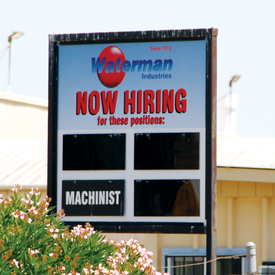 The State of California’s Employment Training Panel (ETP) has granted Waterman Industries $117,000 to enhance and enrich the skills of its local workforce. The ETP was created in 1982 and is funded through an employer-paid payroll tax called the Employment Training Tax. The ETP’s financial support to California businesses helps in strengthening workplace knowledge, productivity, and competitiveness by empowering its workers and creating a healthy labor economy. The company currently employs over 150 at its engineering and manufacturing center in Exeter. All of the company’s employees will participate in the benefits of the training program. Waterman Industries is a recognized leader in water control products for water treatment, wastewater, agriculture, rural water delivery, hydro-power and flood control management. Waterman is a leading provider of water control gates, valves, automated controls and accessories to these markets and key customers such as government agencies (water districts, utilities, flood control districts) and agricultural water users (growers, cooperatives).